Few or many, big or small, we can look after them all. 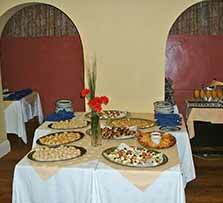 The Cove Room is normally our games room but it can be hired for small functions such as meetings, presentations, buffets, etc. It includes a wall-mounted television which can be connected to a laptop or other equipment. Please contact the hotel to enquire about hiring the room. We are pleased to cater for your special occasion whatever it may be from: Weddings, Christening Parties, small Seminars, Birthdays, Anniversaries, Reunions, Family Gatherings, etc. Enjoy your special day in the knowledge every detail is being looked after. We offer a variety of special function menus and an extensive wine list. If required we have available a cake stand, knife and pillars. Your menus, seating plan and place cards can be printed. Floral decorations for the tables provided. Special accommodation rates for guests staying at the hotel (subject to availability) and use of the 'Cove Room' after your meal if required. Why not hold your function at the nearby village hall? We can produce and deliver all the food for you. Place settings for 75 persons, seats for 100 persons, dancing for 200 persons. There is a stage for bands or disco. A temporary licence needs to be obtained from the Council. Free-standing decorations only; nothing to be attached to the walls, etc. Want to hire a bar for your event? Ideal for weddings, parties and charity events.